Cabinet maker turned skateboard creator, Ben Roosa grew up skateboarding with his childhood pal and company co-founder Scott Hansen. Over the years, Ben and Scott had always talked of starting a business together. In 2012, talk turned into a reality when the idea for Grow Anthology came to Scott in a dream. Why not use Richlite, a press-board material made of 100% recycled paper found in kitchens, schools, and institutions, to design a more durable skateboard? In addition to being stronger than your average board, Grow Anthology skateboards are waterproof to prevent warping and maintain the integrity of the ride even in humid weather conditions. Each board is carefully crafted for quality and precision in the USA. The boards are etched with eco-based designs, and the resulting exposed layers are reminiscent of the growth rings of a tree. And, with every board sold, a new tree is planted. Whether you’re heading to the skate park or just looking for a fun way to zip around campus, it’s easy to be green with a Grow Anthology skateboard under foot. 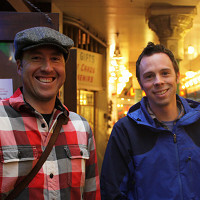 We are Ben and Scott, co-founders of Grow Anthology. We grew up constantly playing outdoors, camping and hiking any chance we had. It's because of our connection to the outdoors that we are so focused on sustainability. With the boards, there are three main design elements that we focused on: Nature, simplicity, and classic surfboard lines and shapes. And of course they are a blast to ride! I'm here to answer any questions you may have, we hope you like them! 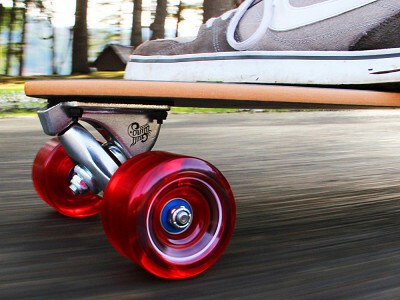 Are all of your skateboards flexible? As in good for beginners. Aaron from The Grommet here. 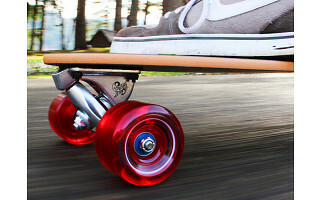 The boards are flexible and balanced well with strength and durability. The material they are made out of is Richlite, which makes the boards stronger than typical wood boards. The Madrone and Stinger are longer boards which helps provide additional stability for beginner riders. Cabinet maker turned skateboard creator, Ben Roosa grew up skateboarding with his childhood pal and company co-founder Scott Hansen. Over the years, Ben and Scott had always talked of starting a business together. In 2012, talk turned into a reality when the idea for Grow Anthology came to Scott in a dream. Why not use Richlite, a press-board material made of 100% recycled paper found in kitchens, schools, and institutions, to design a more durable skateboard? In addition to being stronger than your average board, Grow Anthology skateboards are waterproof to prevent warping and maintain the integrity of the ride even in humid weather conditions. Each board is carefully crafted for quality and precision in the USA. The boards are etched with eco-based designs, and the resulting exposed layers are reminiscent of the growth rings of a tree. And, with every board sold, a new tree is planted.